Nevitt Sanford (1967) developed his theory for student development based on providing a balance of challenge and support. Too much support with too little challenge creates a cushy environment for the student, where development is unlikely to occur. However, the opposite of too little support with too much challenge also makes development an impossible and negative experience. One of the “other duties as assigned” in which our dean of students office staff has the opportunity to participate is football game duty. We partner with the athletics department in an effort to keep the student seating section a safe and fun place to enjoy the game. Each home game, a few staff sign up to attend the game and join our students in the stadium. We arrive before the gates open and greet students who stand in line for hours to race down the stadium steps for a seat in the front row. When seated, we distribute wristbands to the students who made it to the front so that they are able to maintain those seats throughout the game. Our students are big fans. For the most part, if you have been standing in line for four or five hours, you haven’t been taking part in other extracurricular activities that historically take place prior to a football game. So, we work the crowds, meeting students, helping with body paint, and taking photos for students posing with the school mascot. I call it friend-raising. It gets us out with the people that really count, our students. The ones that we want to be successful and graduate from the university. It’s also about providing support and encouraging students to make good choices. Because that is what we do in student affairs. 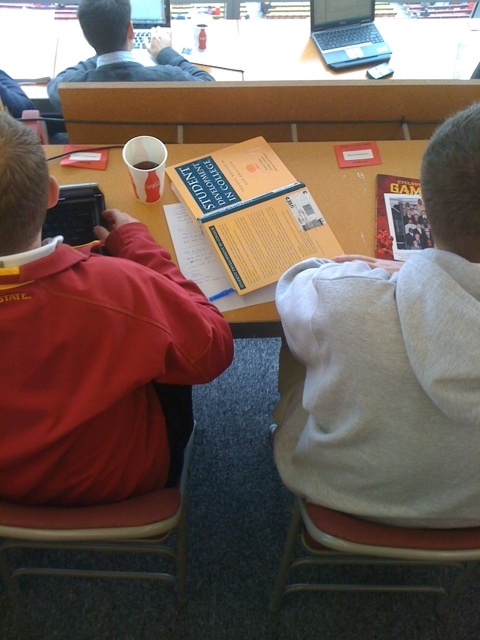 Photo note: Yes, that is a photo of someone in the stadium press box today with a copy of Student Development in College. Yes, he may be an even bigger student affairs geek than me. I never take my books to the game. This entry was posted in Graduation, higher education, student affairs. Bookmark the permalink.